And We Suggest There Are Realistic Solutions. A Restaurant to Serve Businesses and Attract Visitors This is vital because: 1) it will immediately attract year-round visitation from Lake Charles, Lafayette, Beaumont and beyond, from those already accustomed to evening restaurant travel. A new signature restaurant is most important to send the signal that Cameron is safe to drive to and return from; 2) this project builds confidence with the energy companies that do business in Cameron. They need evidence of our stability as a base for their operations so they will not only stay, but increase their presence here when oil and gas futures encourage them; and, 3) families need a place to relax and eat. A Unique Hotel Our waterfront planning experts suggest that creating and augmenting the natural cheniers (beach ridges of higher elevation) are the inventive way to build hotel cottages above the flood plain rules that govern construction here. Without these ridges, buildings must be built on stilts, and make access difficult. Cameron absolutely demands hotel space for tourists, visitors and the workforce. Our one motel has its limits, and is not attractive to the customers looking for higher-end amenities and comfort. A Super-Convenience Store and Fresh Market Businesses, workers, visitors, sportsmen and residents must have fuel, must have the basics, must have the convenience of fresh produce and groceries. And while local operators have been selling their wares as fast as they can, more variety and selection is required. For families to call Cameron home, this needs to be a place where they don’t just survive, but thrive and grow. Retail Shops We are determined to return visitors to Cameron as well, and our oceanside location, wildlife and natural beauty is our guarantee. But visitors need more than that to make Cameron the tourist destination it has been. (In the year prior to Hurricane Rita, more than 300,000 came through Cameron on the Creole Nature Trail!) We propose to locate retail shops, restaurants and a swimming pool on barges alongside the Calcasieu River (the “north loop”) directly across from the center of community activity in Cameron: the Courthouse. A Ferry Opening Access to Monkey Island Abandoned for decades, Monkey Island is ripe for development by shipping, fishing and energy companies. Connecting by ferry allows for new wharves and bulkheads for industry. And it creates opportunity for tourist traffic to three significant destinations: a marina, a Civil War battlefield, and to a new and ambitious Oil & Gas Exposition Center. Oil & Gas Research Exposition Center Of course, the Western Gulf is the center of the nation’s offshore energy reserves, and natural gas either comes ashore through pipelines at Cameron, or will leave our shores to the rest of the world as LNG export facilities are being licensed, built and coming online. We propose the creation of a Center dedicated to the oil and gas industry, a place where energy companies can tell their stories for all to learn. A Pleasureboat Marina and Dockage for Our Fishing Fleet Our studies reveal the demand for both, as deeps-ea fishing is unmatched off Cameron. Sportsmen presently have no place to store their boats other than two hours upriver, so a transient marina will bring families to Cameron to stay overnight and fish during the day. Plus, we intend to create a place for shrimpers to sell their fresh catches directly to the public at dockside. From experience, we know that we can invite designers and developers to submit ideas and estimates for the above projects. To move forward, CameronAnswers proposes to publish Requests for Proposals from qualified architectural and engineering firms, as well as developers and operators. The research indicates both the support and the need to develop and build these project elements at the center of the town of Cameron, on either shore of the river north of Monkey Island. Click here for a closer look at anticipated costs and revenues of each of the seven projects. 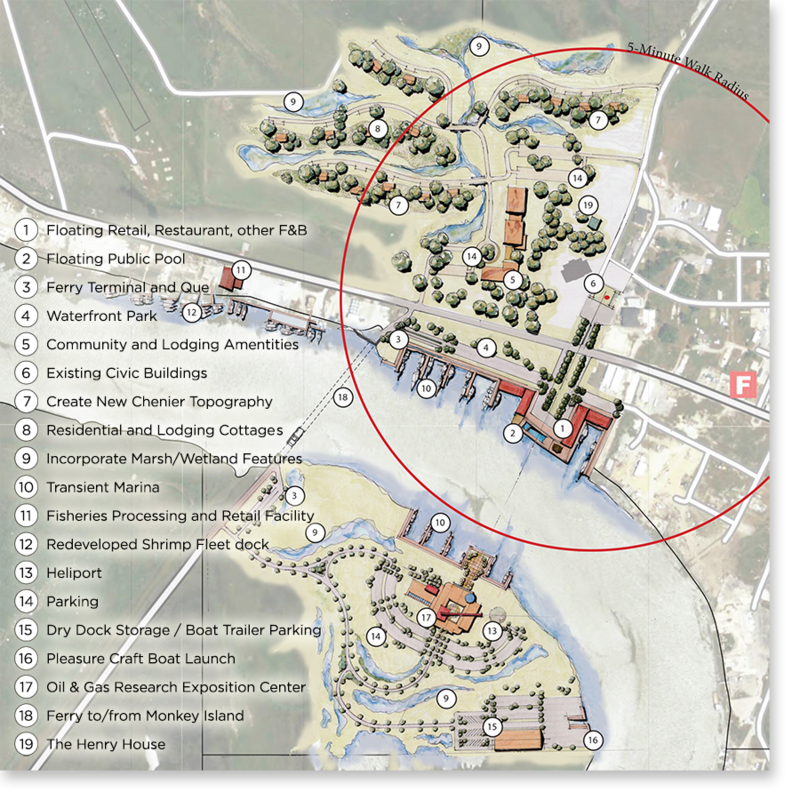 This is the Cameron Waterfront Master Plan created by SmithGroupJJR as the result of their initial site visits and public meetings held on June 26, 2013 and September 22, 2013. For their complete report, download our Master Research Summary. Our Progress. Our Proposals. Our Projects. Originally, our board envisioned a seaside restaurant, hotel and small conference spaces to accommodate visitors, then retail spaces including basic services like groceries and fuel. In 2012, the CA board traveled to Gulfport, Mississippi, to study their new marina, and returned home thinking that a similar facility would create excitement and activity—and serve a demand—in Cameron as well. Now we were ready to act. In December 2013, we published our Master Research Summary (available separately) containing the detailed results of the studies, answering four basic questions we determined necessary in order to move forward. In particular, the Cameron Waterfront Master Plan, created by SmithGroupJJR (www.SmithGroupJJR.com) has provided the framework for next actions. Formed as the result of two site visits, including a public meeting where ideas and comments from residents, business leaders and elected officials were solicited, this Master Plan suggested seven distinct projects that our CameronAnswers group, and community leaders in Cameron Parish, believe will accomplish our Vision.